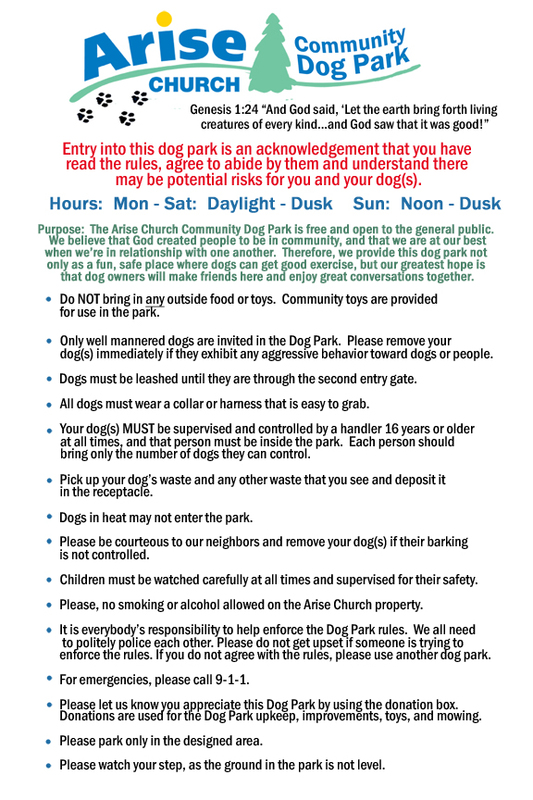 The Arise Community Dog Park is a free dog park, open to the public. It is a 2 acre fenced-in area where dog owners can bring their dogs for unleashed socialization, exercise and play with other dogs. It is located at 11211 Dexter-Pinckney Rd, just south of Darwin Rd, about one mile south of the Pinckney High School. Please park only in the designated area. We believe that God created people to be in community, and that we are at our best when we're in relationship to one another. Therefore, we provide this dog park as a fun, safe place where dogs can get good exercise. Our greatest hope is that dog owners will make friends here and enjoy great conversations together.